This all-impressive and dynamic tart taste flavor of citric acid keeps your juice on edge. 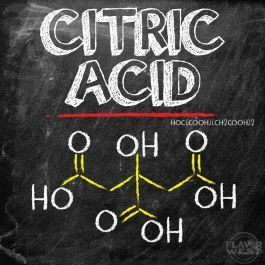 Citric Acid is very tart, and only a small amount is required to give you a yummy taste. Type: Citric Acid Powder. Ingredients: 100% Pure UPS Kosher Grade Citric Acid Powder Usage Rate: 10% for E-use. Flavor suitability: Alcoholic beverages, bread, cheeses, ice cream, drinks, candies, jams, lip balm and more.